One of my favorite genres and one that is the easiest for me to push aside is middle grade fiction. This year to make sure I get a little more children's and young adult fiction I thought I would designate the first Monday of every month Middle Grade Monday (except for February which will be the 2nd Monday). I downloaded the audiobook Chitty Chitty Bang Bang on a whim. I hadn't seen the movie but I'd heard about it and the audiobook was short and available which was exactly what I needed in an audio at that moment. Then I discovered that David Tennant was the narrator so another win. I typically like middle grade fiction so I was prepared to enjoy the story but I ended up being completely and utterly charmed. The book is written by Ian Fleming of James Bond fame and isn't someone I think of as warm and fuzzy but there is a very paternal air about the book. I can easily imagine him telling this one chapter at a time as he's writing it to whatever young children were in his life. There are some explanations that are done in an offhanded manner that were so fun and frequently funny. The story itself is pretty simple. An adventurous family with the last name Potts ends up with a battered motor car that they rescue from the scrap yard. After they fix it up and shine it up a trip to the beach turns into a trip abroad with a run in with some international gangsters. There's a car chase and an explosion and lots of fun. It has the simplicity that I've come to expect from Fleming in the James Bond books but with none of the coldness. The 160 pages are well used. There's no downtime but the story doesn't feel rushed at all. I wanted more but not because the story was left untold but because I was so in love with the family, the car and Fleming's writing style. 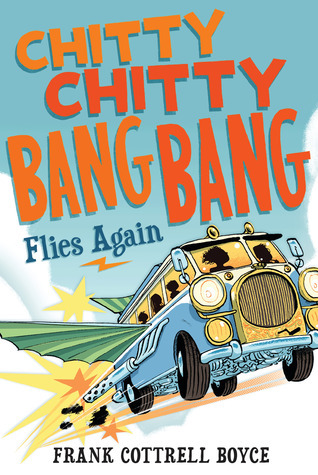 Wanting more led to Chitty Chitty Bang Bang Flies Again by Frank Cottrell-Boyce - another library audio book and another one narrated by David Tennant. This book has a very different style than the first book. It's still an adventure story but it's way more over the top with a lot more moving parts than was in the original. Time has passed and the Potts have been replaced by the Tooting family who discover an old engine up in a try that fits into the body of the camper van they're restoring. They don't know that that engine was once in an unusual car called Chitty Chitty Bang Bang. So begins a whole series of adventures that the adventurous family couldn't have expected. There's a lot more going on here than in the original with multiple villains, several different countries, and a car that may or may not be being helpful. There's also a period of time when the kids are out on their own which I think most younger readers would enjoy. This is decidedly more modern with cell phones and computers and other mentions of technology. The characters of the children are more fleshed out and I absolutely loved Lucy who adores all things black, gloomy, and tragic but is also incredibly funny. There's a lot more adventure in this book but not quite as much charm as in the original and the writing doesn't include the little asides that Fleming excels at. I was surprised by how enjoyable both books were and that the original book which was published in 1964 in no way feels dated. I think children from early elementary school ages up would enjoy this. While there is a lot of adventure and a few tight spots it isn't scary at all and there's a bit of humor mixed into both. I'm planning on adding these to the bedtime book stack for the Tornado (just turned 7) and I imagine that soon he'd enjoy reading these himself. However, I enjoyed both books tremendously and think they'd work well for adults who enjoy middle grade fiction or a reader with a tired brain who just wants a fun story to read! As for the narrator I think David Tennant should narrate everything from now on. He's absolutely amazing and both audiobooks featured a short interview at the end where his enthusiasm for the books shone through and made it even more special. 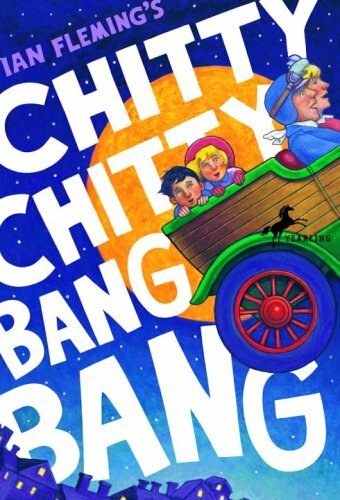 It still cracks me up that Ian Fleming wrote Chitty Chitty Bang Bang. I just had no idea. Loved that movie as a kid! I don't think I knew there was a second one. I can see maybe tracking down the first one, just to relive the memories (and I've never read it). I'm curious about this narrator now. I'm not usually picky and have enjoyed all the audiobooks I've listened to except that bump in the road, The Cracked Spine. It also had to do with the storyline which I had forgotten to mention. This sounds like fun. I have put on kid's books in the car when we are traveling for the family to listen to before and this sounds like it would be a good choice. We listened to Wizard of Oz as a family just driving to games and such. I will have to look for these. David Tennant no Morgan Freeman could narrate my life! It's almost my granddaughter's birthday so I am taking your advice, getting an audio book with a photo book. I will it when I do. It is always wonderful when a classic children's book doesn't feel dated. I've seen the film, but never read the book, which I find tends to be the case with a lot of children's classics for me. Having heard your thoughts, I'll have to look into the books for sure. Thanks for sharing! I haven't read any of these books, although I remember the movie versions. :-) I am glad these books have held up so well. I will have to read them. Or rather, listen to them. I mean, David Tennant. Love him. What a lovely review:). I recall reading the Ian Fleming version when I was a girl and enjoying it after seeing the film - but now I have a grandson who might find this an amusing break from the series of How To Train Your Dragon we are currently working through. Thank you for sharing. Now you have to watch the movie - I adore it! And, clearly, now I need to read the book!